Name Variation Johannes Peter Spyker was also known as Johann Peter. Name Variation Johannes Peter Spyker was also known as John Sr.
Name Variation Johannes Peter Spyker was also known as John Peter. Johannes Peter Spyker was born circa 1685 at Germany. He married unknown (?) before 1711. Johannes Peter Spyker married Regina (?) before 1749. Johannes Peter Spyker died in February 1762 at Berks, Pennsylvania. In 1729 The Spykers, Crists, Kadermans, &c., came over with Conrad Weiser to New York, in 1710, from a place called Herrenburg, in Wurtemberg, Germany. In 1729, they all removed together to Tulpehocken, Berks County, Pennsylvania. Johannes Peter Spyker and Peter Spyker immigrated on 14 September 1737 to Southern Germany to Philadephia, then to, Tulpehocken, Berks, Pennsylvania, Another progenitor of the Speicher line is John Spyker Sr. who came to America on the ship St. Andrew on September 4, 1737 to Philadelphia. The Speicher name is thus spelled Speicher, Spicher, Spyker, and Spiker. ************* Also reported as 30th of Aug. 1737. Judge Peter Spyker died in 1789. His will is very lengthy and elaborate. In it he mentions his sons Benjamin, Henry, Peter, and John and son in law Phil Gardner. Benjamin resided in Lebanon in 1790 Perhaps the best known of any member of the Spyker family was Colonel Henry Spyker of the Revolution He was (as above) the sixth child of Judge Peter. At the early age of 23 years he was in 1776 Adjutant of Col Patton's regiment of Pennsylvania militia, and was on duty in New Jersey, when he heard, as he records in his journal thunder, of battle. He was afterwards colonel of the Sixth battalion. On August 26, 1777, he was commissioned paymaster of the Berks county militia, a position which he occupied until July 27, 1785. During this time his services to the State were simply invaluable. Amid the clamoring of the poorly paid troops he was compelled to exhaust every means of procuring the necessary funds, sometimes supplying the money from his own individual resources. His receipt book covering this long period is a model of neatness and correctness. He expended (British Pounds) 122,847 7s 6d (over $614,235) and accounted accurately for every penny. At the close of the Revolution he engaged in the mercantile business in his native place, besides taking a deep interest in public affairs. In 1784 Mr Spyker was elected to the State Legislature, a position which he filled for three successive terms. In 1795 he erected the first brick house in the newly laid out town of Lewisburg. In 1797 he closed out his interests in Berks county and removed to Lewisburg, then in Northumberland, now in Union county, and the county seat, ten miles above Sunlxiry on the Susquehanna River. At Lewisburg he again engaged in the mercantile business. Soon after his removal to this place he was commissioned a justice of the peace in which capacity he did a vast amount of business until the period of his death, which occurred on July 1, 1817. His wife Maria Weiser Spyker born 1754 died October 11, 1829. Both are buried at Lewisburg where their graves may be seen in the cemetery. They left a number of children. Married Name before 1711 As of before 1711,her married name was Spyker. Unknown (?) was born circa 1685 at Germany. She married Johannes Peter Spyker before 1711. Name Variation John Benjamin Spyker was also known as Benjamin. John Benjamin Spyker married Margaretha Barbara Yeiser. John Benjamin Spyker was born on 30 September 1723 at Palatinate, Germany. John Benjamin Spyker died on 31 August 1802 at Tulpehocken, Berks, Pennsylvania, at age 78 78y 11m 1d. SPYKER BENJAMIN of Berks County a native of the Palatinate was born about 1723. His father, John Peter Spyker, came to Pennsylvania in 1738, arriving at Philadelphia in September of that year. He settled in Tulpehocken Township, Berks County, and took up a large tract of land. The first we hear of the son Benjamin is in 1744, when he was licensed as an Indian trader. He served as an officer in the Provincial service during the French and Indian wars and at the beginning of the Revolution assisted in organizing the Associators in his county. He was a member of the Provincial Conference of June 18, 1776 and of the Convention of the 15th of July following. For many years prior to his death in September 1802, Capt Spyker served as a justice of the peace for his neighborhood. His son Henry, who was commissioned paymaster of the Berks County militia August 26, 1777, was also a justice of the peace. In 1799 he removed to East Buffalo Township, Union County, where he died about 1813. John Benjamin Spyker immigrated with Peter Spyker and Johannes Peter Spyker on 14 September 1737 at Southern Germany to Philadephia, then to, Tulpehocken, Berks, Pennsylvania; Another progenitor of the Speicher line is John Spyker Sr. who came to America on the ship St. Andrew on September 4, 1737 to Philadelphia. The Speicher name is thus spelled Speicher, Spicher, Spyker, and Spiker. ************* Also reported as 30th of Aug. 1737. [S345] Pennsylvania, History of Berks County in the Revolution 1774-83, page 274-275. Margaretha Barbara Yeiser married John Benjamin Spyker, son of Johannes Peter Spyker and unknown (?). Margaretha Barbara Yeiser was born on 18 June 1715. She died on 2 July 1806 at Berks, Pennsylvania, at age 91 Margaretha Barbara Spyker, widow of Benjamin Spyker, died on the 2nd in Tulpehocken Twp., this county, aged 90y 2wks. Married Name before 1749 As of before 1749,her married name was Spyker. Regina (?) was born circa 1695. She married Johannes Peter Spyker before 1749. Married Name 9 December 1766 As of 9 December 1766,her married name was Uhler. Margaret Barbara Spyker was born on 13 July 1749 at Berks, Pennsylvania. She was the daughter of Johannes Peter Spyker and Regina (?). Margaret Barbara Spyker married John Christopher Uhler on 9 December 1766 at Lebanon, Pennsylvania. John Christopher Uhler was born circa 1749. He married Margaret Barbara Spyker, daughter of Johannes Peter Spyker and Regina (? 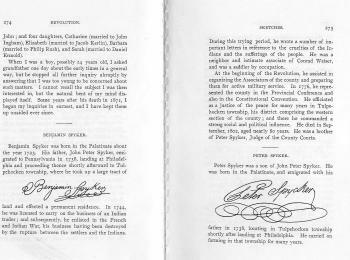 ), on 9 December 1766 at Lebanon, Pennsylvania. Peter Spyker was born on 20 February 1752. He was the son of Johannes Peter Spyker and Regina (?). Peter Spyker married Anna Maria Buhler on 28 April 1772 at Lebanon, Pennsylvania. Married Name 28 April 1772 As of 28 April 1772,her married name was Spyker. Anna Maria Buhler was born circa 1752. She married Peter Spyker, son of Johannes Peter Spyker and Regina (? ), on 28 April 1772 at Lebanon, Pennsylvania. Johannes Spyker was born in 1775. She was the daughter of Peter Spyker and Anna Maria Buhler. Johan Jacob Spyker was born in 1780. He was the son of Peter Spyker and Anna Maria Buhler. Johanna Regina Spyker was born in 1782. Name Variation John Conrad Weiser was also known as Johannes Conrad. John Conrad Weiser was born on 29 September 1725 at Berks, Pennsylvania. He was the son of Christopher Frederick Weiser and Catherine Elizabeth Roeder. John Conrad Weiser married Maria Margaret Batdorf, daughter of Johannes Martin Batdorf and Margaretha Elisabetha Walborn, on 29 January 1749 at Lancaster, Pennsylvania. John Conrad Weiser married Elizabeth Preiss on 3 February 1774. John Conrad Weiser died in September 1775. 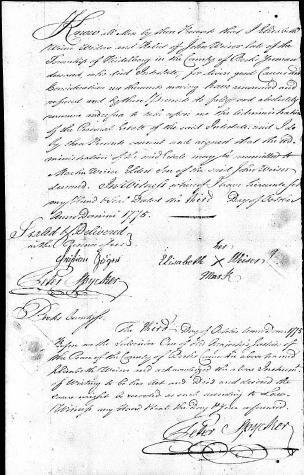 His estate was probated on 3 October 1775 at Berks, Pennsylvania, Probate record for John Weiser by his wife Elizabeth Weiser asking for eldest son Martin to be executor. Known as Johannes Weiser, perhaps to distinguish him from his uncle, John Conrad, the Indian diplomat. Christopher Frederick Weiser was born on 24 February 1699 at Gross Aspach, Wurttemberg, Germany. He was the son of John Conrad Weiser and Anna Magdalena Uebele. Christopher Frederick Weiser married Catherine Elizabeth Roeder in 1724 at 2nd marriage for her. Christopher Frederick Weiser died on 6 June 1768 at Emmaus, Lehigh, Pennsylvania, at age 69. He was buried on 16 June 1768 at Old Moravian Cemetery, Emmaus, Lehigh, Pennsylvania. Christopher Frederick Weiser immigrated with John Conrad Weiser on 13 June 1710 at London to, New York, New York; left for America June 24, 1709; John Conrad sold his property to his already-married eldest daughter and took the surviving eight children to London, from which they embarked several months later. The ships floated around in various English harbors from December 1709 until April 1710, when 3 warships and Robert Hunter, NY governor, joined the group and began the crossing. Conditions were dreadful and many died. Their vessel, the Lyon, landed at New York on June 13, 1710, with nine other vessels full with 800 other families, who had fled down the Rhine valley to Rotterdam, and then across to London to escape the ravages and persecutions of Louis XIV, the Catholic, had let loose on Protestant Germany after the Revocation of the Edict of Nantes in 1685. The poor of London had come to resent them deeply, and that's why many of the immigrants were rushed off to New York to serve as a buffer against the French, a Protestant buffer, and as suppliers of naval stores. There, about 2400 souls of the original 4000 who started the trip made it to quarantine on Governor's Island in Manhattan. About 250 more people died there, and were buried on Governor's Island. The English insisted that older children be indentured to settled residents, so John Conrad's two children George Frederick and Christopher Frederick were bound out by the governor to Long Island. The remaining Palatine immigrants were bound to produce tar from the pitch of pine trees at camps near the Hudson River, about 100 miles north of New York City. Eventually, there came to be the East Camps (really four small villages of Annesbury, Queensbury, Haysbury and Hunterstown, with a joint population of 1189), and the West Camps (614 people in 3 villages). It is doubtful if there are that many people there today, according to Elaine B Liepshutz, in The Palatine Camps of 1710! The settlers were divided into five villages at first, and John Conrad was the head of Queensbury. As such, he voiced the complaints of his fellowmen before Governor Robert Hunter, who was caught in an impossible situation: the trees could produce no tar, the overseer of the Palatines (Robert Livingston) was a scoundrel, and the Germans expected better conditions-- plenty of food (all provisions were issued from Manor warehouses) and land of their own. Even children walked the three miles to the pine forests to work, picking up fallen knots from trees. In 1729 The Spykers, Crists, Kadermans, &c., came over with Conrad Weiser to New York, in 1710, from a place called Herrenburg, in Wurtemberg, Germany. In 1729, they all removed together to Tulpehocken, Berks County, Pennsylvania. Name Variation John Conrad Weiser was also known as Johann Conrad. Name Variation John Conrad Weiser was also known as Conrad. John Conrad Weiser was born in 1660 at Grossapach (Gross Aspack), Germany. He was the son of Jacob II Weiser and Anna Tretz. John Conrad Weiser married Anna Magdalena Uebele, daughter of Hanna Johannas Uebele and Anna Catherine (? ), circa 1686 at Germany. John Conrad Weiser married Anna Margaret Miller in 1711. John Conrad Weiser died on 13 July 1746 at Womelsdorf, Berks, Pennsylvania. Service: Captain of the Queensbury Co. of Palatines Expedition against Montreal. They had sixteen children. After his wife, Anna's, death, he came to America with eight children, arriving in New York on 13 June 1710. In the Spring of 1711, he had married Anna Margaret Miller, and with her he had three children. However, nothing is known of their life together. They came from the Palatinate to East Camp, Dutchess County. It is generally believed that Johann Conrad Weiser was buried at Zion or Reed's Churchyard in Stouchburg, Pennsylvania; however there are some grounds for assuming he found his last resting place at the Weiser farm, now Weiser Park, in Womeldorf. Weiser Family, Phalzische Familien und Wappenkunde Vol. Five No. 10 (1966). Translated January 1973; JDBaldwin): Among the leaders of the German colonists who settled in America in 1710 (the majority came from the Pfalz so they were generally called Pfalzer, or Palatines) were two Schwabians, Johann Conrad Weiser Sr. born about 1662 in Grossaspaach, Wuerttember, died 1746 in Tulpehocken, Berks Co, Penna., and his son Johann Conrad Weiser Jr. born in Kueppingen bei Affstaett, Wuerttemberg, Nov 2, 1696, died in Tulpehocken July 13, 1760. Johann Conrad Sr. first entered into marriage with Anna Magdalena Ubelen (?-Ubele), daughter of Hans Ubelen. The couple had fifteen children, the names of thirteen of which are known. Johann Conrad was corporal the Wuerttemberg "Blue Dragoons" as he wrote down in his family record. He must have concluded his service in the troop about 1700, for at that time he first appears in the records as a baker, an occupation which he pursued up to his emigration for America in 1709. During fifteenth confinement, Anna Maria died suddenly on May 1, 1709, following convulsions. Johann Conrad left Grossaspach (probably from dissatisfaction with living conditions there) on June 24, 1709. His oldest daughter, already married, bought his property, and he took his eight remaining living children with him. They went to London, from where they sailed for America a month later. Their ship "The Lyon" landed in New York June 13, 1710. Then began an unaccustomed career for the German emigrant who up to this time had led a harsh life in Wuerttemberg. As soon as Johann Conrad came into association with the other German immigrants, he became more and more their leader. In New York, Palatine immigrants were undertaking production of tar from the rosin of the sprucewood. They lived in an encampment in the vicinity of Hudson, about 100 miles north of New York City. Next, the colonists were divided among five villages. Johann Conrad was the administrator of one of these villages. In this position he represented the interests of the settlers before Governor Robert Hunter in facing the most impossible problems. No more tar could be produced from the trees, the overseer of the Palatines, Robert Livingston, was a villain, and the Germans needed better living conditions, above all better nutrition and some land. During the military campaign of 1711, the difficulties reached their highpoint. Johann Conrad was one of the leaders of the Palatine troop contingents. As the soldiers returned from an unsuccessful battle in the north of New York and recognized that their families were on the edge of hunger, Weiser brought the grievances of the Palatines before the governor. This event ended with Hunter becoming enraged against the Palatines and ordered their disarmament. Nevertheless, the following year he guaranteed them complete freedom in the selection of their settlements. 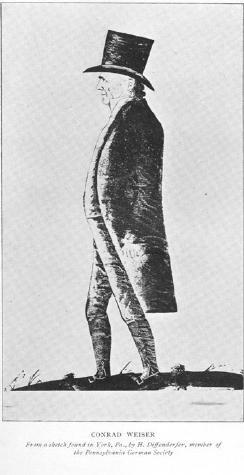 Johann Conrad was one of the men who were subsequently selected by the German immigrants to seek land at Schoharie, about fifty miles west of Albany. Soon after, a small village known as Weiserdorf was established there. This place is known as Middleburg today. The living conditions were wretched, however through hard work, they created a new home for themselves in this wilderness. John Conrad Weiser immigrated on 13 June 1710 to London to, New York, New York, left for America June 24, 1709; John Conrad sold his property to his already-married eldest daughter and took the surviving eight children to London, from which they embarked several months later. The ships floated around in various English harbors from December 1709 until April 1710, when 3 warships and Robert Hunter, NY governor, joined the group and began the crossing. Conditions were dreadful and many died. Their vessel, the Lyon, landed at New York on June 13, 1710, with nine other vessels full with 800 other families, who had fled down the Rhine valley to Rotterdam, and then across to London to escape the ravages and persecutions of Louis XIV, the Catholic, had let loose on Protestant Germany after the Revocation of the Edict of Nantes in 1685. The poor of London had come to resent them deeply, and that's why many of the immigrants were rushed off to New York to serve as a buffer against the French, a Protestant buffer, and as suppliers of naval stores. Name Variation Anna Magdalena Uebele was also known as Ubelen. Name Variation Anna Magdalena Uebele was also known as Ubelin. Married Name circa 1686 As of circa 1686,her married name was Weiser. Anna Magdalena Uebele was born in 1668. She was the daughter of Hanna Johannas Uebele and Anna Catherine (?). Anna Magdalena Uebele married John Conrad Weiser, son of Jacob II Weiser and Anna Tretz, circa 1686 at Germany. Anna Magdalena Uebele died on 1 May 1709 Anna Magdalena, widow of Johann Conrad Weisser... was bur. 1 May 1709, aged 43 yrs - pregnant with her 15th child. Name Variation Colonel John Conrad Weiser was also known as Conrad. Colonel John Conrad Weiser was born on 2 November 1696 at Germany. Colonel John Conrad Weiser married Anna Eva Feck on 22 November 1720 at New York. Colonel John Conrad Weiser died on 13 July 1760 at Womelsdorf, Pennsylvania, at age 63 Conrad died 7/13/1760 on his farm at Womelsdorf PA, where he is buried. A sandstone slab marks the spot of his final journey with the inscription "Dieses ist die Ruhe Staette des weyl Ehren geachten M Conradt Weiser. der Selbige gebohren 1696 d 2 November in Astaet im Amt Herrenberg im wittenberger Lande und gestorben 1760 d 13 Julius ist alt worden 64 Jahr 3M 3 wch" or "This is the resting place of the greatly honored respected M Conradt Weiser, the same born..."
tract which included the privilege of a "Court-Baron", granted to him in 1743, the tract having originally contained 5,165 acres as granted to John Page in 1735, and having then been erected into a manor, called the "Manor of Plumton". At Reading one of his properties was business stand, and it has continued to be a prominent business location from that time till now, a period embracing over 150 years. The eldest son of John Conrad and Anna Magdelena (Uebele) Weiser was given his father's names at his birth 2 November 1696. By his own statement, his birth took place at Affstaett about twenty miles southeast of Stuttgart, where it is assumed some of all of his father's military unit lay in winter quarters. One farm in the village, the "Powder Farm" is said to have been used for this purpose. Conrad may well have been born there. He became known generally as Conrad Weiser. Although Conrad's statement exists that he was baptized at Kuppingen, a village nearby, there is no entry in its records of this fact. Perhaps this was an oversight of the pastor, an explanation especially conceivable when it is realized that there are gaps in the parochial registers. Perhaps as a child of a member of the military not from the area, Conrad's baptism was not considered by the pastor appropriate to enter. Conrad emigrated to America in 1710 with his father, a shortly thereafter was placed in the hands of the Mohawks. From them he acquired the knowledge of Indian words and ways which launched him on the career that has made his name known in the annals of Pennsylvania and national history of the colonial era... Conrad Weiser was born in the German principality of Württemberg on November 2, 1696. But shortly after his birth, Conrad's father heeded Queen Anne of England's invitation to migrate to England and the British Colonies in America. Eventually, the Weiser family settled in New York. By the age of 15, young Weiser had developed a keen sense of language and a genuine interest in the local Iroquois Indian population. He applied his linguistic abilities to learn their language, with hopes of improving treaty negotiations between the English settlers and the Indians. He was generally concerned with stabilizing relations between the two parties. Once he learned their language, it didn't take long for him to understand their religion and customs. Eventually, he grew to appreciate Indian culture as much as his native German and adopted English heritages. The Indians learned to trust and love him as one of their own. They appreciated the talents of Weiser even more so than the English. While living in New York, Weiser met Shiekilammy, Chief of the Oneidas, from the powerful Six Nations (the Iroquois Confederacy). They met in the woods of New York where Weiser was hunting. According to legend, Shiekilammy was so pleased to meet a white man who spoke his language that they became friends almost immediately. Weiser and Shiekilammy formed an effective partnership--the white man and the Indian--determined to establish good relations between the foreign settlers and the native Indians. Soon after his marriage--Weiser had married young and proceeded to have 17 children, only 7 of whom lived to adulthood--Conrad Weiser packed up and moved from the Mohawk valley of New York to the Tulpehocken Valley in Pennsylvania. With Chief Shiekilammy and James Logan, Provincial Secretary for Pennsylvania, he then authored the Commonwealth's Indian Policy. Using his intimate knowledge of the Indian way of life, Weiser created a policy that strengthened the Six Nations by giving them sovereignty over all other Indians in Pennsylvania. This policy also strengthened the position of the English, since allowed the Six Nations to deal with other Indian tribes that were opposed to their plans. Because Weiser was respected by both parties to these negotiations, few objected to the policy he had crafted. He is commemorated in the Alle-Kiski area of Armstrong County for his early diplomacy on behalf of the colonial government in 1748. Even if Weiser had not developed Indian policies or authored treaties, he would still be remembered as a model citizen who was a significant player in the expansion of Pennsylvania. In 1749, he helped found the city of Reading, and he played a role in the creation of Berks County in 1752. In Conrad Weiser's Account book, he revealed that he paid for the writing and copies of the petition, filing fees, and surveys for the proposed county. Early Western Journals is the first official record of the English settlers' trips into the Indian country west of the Alleghenies. In it, Weiser writes that his main purpose on the trip was to carry and deliver a present to the Indians from the Pennsylvania and Virginia authorities. Some of these journals are now available online at the Library of Congress. 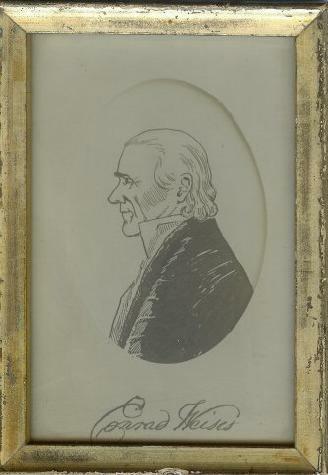 In his later life, Conrad Weiser applied the skills and experience he had gained from his early years as a translator and interpreter to a series of more practical, and profitable, enterprises. He was a very successful farmer, tanner, and shop owner. But at the age of 64, Weiser's health rapidly deteriorated and he passed away. Upon his death, an Iroquois Indian observed, "We are at a great loss and sit in darkness...as since his death we cannot so well understand one another." His name is currently preserved by the school district centered on Robesonia in Berks County. Biography of Conrad Weiser - Perhaps the most fitting accolade bestowed on Conrad Weiser was by an Iroquois, who, speaking to white men upon the death of Weiser in 1760, lamented, "We are at a great loss and sit in darkness...as since his death we cannot so well understand one another." Who was this man who had such far-reaching influence on relations between Pennsylvania and the Iroquois Confederacy; who had access to provincial governors and sachems alike; who interpreted and negotiated treaties; who was commissioned an officer during the War for Empire; but who also sat as a country judge, served as lay minister, and prospered as a farmer, tanner, and storekeeper? Conrad Weiser was born November 2, 1696, in the German principality of Wurttemberg. By 1709, his father, Johann Conrad Weiser, had decided to heed Queen Anne's invitation to inhabitants of the Rhine Valley to migrate to England and to the British colonies in America. The Weiser family settled on the New York frontier and in the winter and spring of 1712-1713, young Conrad resided with neighboring Mohawks to learn the language of the Iroquois and serve as a go-between for the German community. During his years in New York, Weiser acquired a keen knowledge of the language, customs and statesmanship of the Iroquois Confederacy (or Six Nations), consisting of the Mohawks, Oneidas, Onondagas, Cayugas, Senecas and Tuscaroras. By 1723, Germans from the Mohawk Valley had begun the overland trek 400 miles, following the Susquehanna river to settle the Tulpehocken Valley in what is now Berks and Lebanon Counties, Pennsylvania. In 1729, Weiser brought his German-born wife, Anna Eve, and their children to the Tulpehocken region, settling on 200 acres near the present town of Womelsdorf. Over the next 31 years Weiser became a major land-holder, farmer, tanner and businessman. He and Anna Eve raised 14 children (seven of whom lived to adulthood). By the early 1730's, Weiser had become known in government circles in Philadelphia for his knowledge of the Iroquois. Provincial Secretary James Logan hired him to guide the new Pennsylvania Indian policy recognizing Iroquois dominance over the indigenous Lenni Lenape and guaranteeing a stable and safe frontier. Over the next two decades Weiser was constantly directing and implementing this policy through treaty negotiations, land purchases, and journeys to the Iroquois homeland. He worked closely with Shikellamy, who had been appointed by the Confederacy to embody Iroquois authority over the Lenni Lenape. It was through Weiser and Shikellamy that the Pennsylvania frontier remained stable and peaceful until mid-century. By 1755, however, growing competition between Britain and France had ignited a full-blown "War for Empire." Diplomacy was put aside as the Six Nations divided over which side to join. Meanwhile, the French established an alliance with the Lenni Lenape and other Native American peoples and launched raids against the eastern Pennsylvania settlements along the Blue Mountain line. Pennsylvania responded by forming provincial militia and building a line of outposts. In 1756, Weiser received a commission of Lieutenant Colonel with command of the 1st Battalion, Pennsylvania Regimen responsible for manning the line between the Delaware and Susquehanna Rivers. He held this post until 1758. In that same year an expedition to western Pennsylvania by General John Forbes resulted in the eviction of the French and an end to the fighting in eastern Pennsylvania. Throughout his life, Weiser was active in local affairs. He served as a magistrate for Lancaster County, helped found and lay out the town of Reading in 1748, helped to establish Berks County in 1752, and was its President Judge until his death. Though a Lutheran, Weiser joined the monastic community of Ephrata Cloister between 1735 and 1741. He lived intermittently as a celibate brother, withdrawing from family and political life until becoming disenchanted with the Cloister's leader Conrad Beissel. Weiser, returning to the Lutheran Church, in which he had served as a lay minister, became a founder of Trinity Church in Reading. His daughter Maria married Henry Melchoir Muhlenberg, "patriarch" of the Lutheran Church in Pennsylvania. At this death on July 13, 1760, Weiser owned several thousand acres, in addition to his farm, tannery and the store in Reading. Movements to honor Weiser's considerable accomplishments culminated in the establishment of the Conrad Weiser Memorial Park by the Conrad Weiser Memorial Park Association in 1928. The nationally known Olmsted Brothers landscape firm designed the park. Owned now by the Commonwealth, the Conrad Weiser Homestead is administered by the Pennsylvania Historical and Museum Commission, which preserves the restored Weiser structures, graveyard and landscaped park, in addition to interpreting Weiser's life. Conrad Weiser, Pennsylvania's Indian ambassador, was one of the world's great originals, a hotheaded, true-hearted, whimsical Jack-of-all-trades; a farmer and owner of a tannery, one of the founders of Reading, Pennsylvania, a colonel during the French and Indian War, the first President judge of Berks County, a monk at Ephrata Cloisters, a pillar of the Lutheran Church, a promoter of Moravian missions, a rebel in New York and prisoner in an Albany jail, a hymn-writer, traveler, statesman, linguist, diplomat, woodsman and most notably an Indian agent. His career introduces us to the whole colonial scene from New York to the Carolinas, taking in the seacoast towns, the frontier settlements, the forests of the Alleghenies, and the long houses and cabins of the Indians on the Hudson, Mohawk, Delaware, Susquehanna, and Ohio Rivers. He bought books from Benjamin Franklin and taught him what he knew about the Iroquois. He corresponded with Thomas Lee, the "President of Virginia." He quarreled with Gov. Denny of Pennsylvania, and in the conduct of Indian affairs, he was the rival of George Washington and Sir William Johnson. He introduced Count Zinzindorf to the Shawnees and saved his life in the Wyoming valley. He was advisor to Thomas Penn, General Forbes, and countless other notables. In his day, everyone knew him. Governors, churchmen, and Indian chiefs all relied on his advise. The Iroquois named him Tarachiawagon, "He Who Holds The Heavens." He was at home on Society Hill in Philadelphia as well as at John Harris' Ferry on the western frontier. He knew the Shamokin Trail like a village street and visited all the distant Indian towns from Onandaga to Logstown. He went everywhere, saw everyone, did everything and recorded in his journals, the most important information of his day. There was never any man like him, and never will be. He was as vital to the Pennsylvania frontier as George Washington was to Valley Forge. Yet, through all the excitement of his public life, he remained a common man who, above all else, always longed for his wife, his children and the little Tulpehocken home to which he came back finally to die. At Berks, Pennsylvania, Relationship between Conrad Weiser and Henry Melchoir Muhlenberg. In . . . 1709 my Father moved away from Great Aspach on the 24th of June, and took eight children with him. My eldest sister, Catrina, remained there with her husband, Conrad Boss, with whom she had two children. My father sold them his house, fields, meadows, vineyard and garden, but they could only pay him 75 gulden. . . so it was made a present to them. In about two months we reached London in England, along with several thousand Germans whom Queen Ann, of glorious remembrance, had taken in charge, and was furnishing with food. About Christmas day we embarked, and ten shiploads with about 4,000 souls were sent to America. He immigrated with John Conrad Weiser on 13 June 1710 at London to, New York, New York; left for America June 24, 1709; John Conrad sold his property to his already-married eldest daughter and took the surviving eight children to London, from which they embarked several months later. The ships floated around in various English harbors from December 1709 until April 1710, when 3 warships and Robert Hunter, NY governor, joined the group and began the crossing. Conditions were dreadful and many died. Their vessel, the Lyon, landed at New York on June 13, 1710, with nine other vessels full with 800 other families, who had fled down the Rhine valley to Rotterdam, and then across to London to escape the ravages and persecutions of Louis XIV, the Catholic, had let loose on Protestant Germany after the Revocation of the Edict of Nantes in 1685. The poor of London had come to resent them deeply, and that's why many of the immigrants were rushed off to New York to serve as a buffer against the French, a Protestant buffer, and as suppliers of naval stores. There, about 2400 souls of the original 4000 who started the trip made it to quarantine on Governor's Island in Manhattan. About 250 more people died there, and were buried on Governor's Island. The English insisted that older children be indentured to settled residents, so John Conrad's two children George Frederick and Christopher Frederick were bound out by the governor to Long Island. The remaining Palatine immigrants were bound to produce tar from the pitch of pine trees at camps near the Hudson River, about 100 miles north of New York City. Eventually, there came to be the East Camps (really four small villages of Annesbury, Queensbury, Haysbury and Hunterstown, with a joint population of 1189), and the West Camps (614 people in 3 villages). It is doubtful if there are that many people there today, according to Elaine B Liepshutz, in The Palatine Camps of 1710! The settlers were divided into five villages at first, and John Conrad was the head of Queensbury. As such, he voiced the complaints of his fellowmen before Governor Robert Hunter, who was caught in an impossible situation: the trees could produce no tar, the overseer of the Palatines (Robert Livingston) was a scoundrel, and the Germans expected better conditions-- plenty of food (all provisions were issued from Manor warehouses) and land of their own. Even children walked the three miles to the pine forests to work, picking up fallen knots from trees. In 1729 The Spykers, Crists, Kadermans, &c., came over with Conrad Weiser to New York, in 1710, from a place called Herrenburg, in Wurtemberg, Germany. In 1729, they all removed together to Tulpehocken, Berks County, Pennsylvania. On 17 August 1844 Henry A Muhlenberg biography - reference to father-in-law Col. Conrad Weiser. On 5 April 1856 John Conrad Weiser biography. On 9 November 1861 John Conrad Weiser family article and will. Name Variation Maria Margaret Batdorf was also known as Maria Margaretha. Name Variation Maria Margaret Batdorf was also known as Bottorff. Name Variation Maria Margaret Batdorf was also known as Battorf. Married Name 29 January 1749 As of 29 January 1749,her married name was Weiser. Married Name 29 January 1748/49 As of 29 January 1748/49,her married name was Weiser. Maria Margaret Batdorf was born on 10 October 1729 at Tulpenhocken, Lancaster, Pennsylvania. She was the daughter of Johannes Martin Batdorf and Margaretha Elisabetha Walborn. Maria Margaret Batdorf married John Conrad Weiser, son of Christopher Frederick Weiser and Catherine Elizabeth Roeder, on 29 January 1749 at Lancaster, Pennsylvania. Maria Margaret Batdorf died on 22 December 1772 at Pennsylvania at age 43. Name Variation Catherine Elizabeth Roeder was also known as Maria Catharine. Name Variation Catherine Elizabeth Roeder was also known as Elizabeth. Married Name 1724 As of 1724,her married name was Weiser. Catherine Elizabeth Roeder was born on 25 December 1702 at Neuwied, Germany. She married Christopher Frederick Weiser, son of John Conrad Weiser and Anna Magdalena Uebele, in 1724 at 2nd marriage for her. Catherine Elizabeth Roeder died on 29 July 1760 at Heidelberg, Berks, Pennsylvania, at age 57. Name Variation Anna Eva Feck was also known as Anna Eve. Married Name 22 November 1720 As of 22 November 1720,her married name was Weiser. Anna Eva Feck was born on 25 January 1700. She married Colonel John Conrad Weiser, son of John Conrad Weiser and Anna Magdalena Uebele, on 22 November 1720 at New York. Anna Eva Feck died on 11 June 1781 at age 81 "Anno 1781, on the 11th of June, early about 2 o'clock, did the wife and mother Anna Eva Weiser, widow, fall asleep at the home of her son Peter in Womelsdorf Town, and on the 12th of June buried by the old Church" --document quoted by HMM Richards in The Weiser Family (LancasterPA. : The Pennsylvania German Society, 1924), p.27. Married Name 22 April 1745 As of 22 April 1745,her married name was Muhlenberg. Anna Maria Weiser was born on 24 June 1727. She was the daughter of Colonel John Conrad Weiser and Anna Eva Feck. Anna Maria Weiser married Reverand Henry Melchior Muhlenberg, son of Nicholas M. Muhlenberg, on 22 April 1745. Anna Maria Weiser died on 23 August 1802 at age 75. Reverand Henry Melchior Muhlenberg was born on 6 September 1711 at Hanover, Germany. He was the son of Nicholas M. Muhlenberg. Reverand Henry Melchior Muhlenberg married Anna Maria Weiser, daughter of Colonel John Conrad Weiser and Anna Eva Feck, on 22 April 1745. Reverand Henry Melchior Muhlenberg died on 7 October 1787 at age 76. At Berks, Pennsylvania, Relationship between Conrad Weiser and Henry Melchoir Muhlenberg. Henry Melchior Muhlenberg, D. D., considered the Patriarch of the Lutheran Church in America, was the founder of the Muhlenberg family in this country to which he had come from Germany in 1742. He first went to Georgia, but soon afterwards came to Pennsylvania where he settled at The Trappe, now in Montgomery County, living there until his death in 1787 and establishing a high reputation for learning. He was the father of three sons, all of whom became eminent leaders in the affairs of their country: Major General Peter Muhlenberg, one of President Washington's generals throughout the entire Revolutionary War, a member of Congress while Washington was President, and later United States Senator from Pennsylvania; Frederick Augustus Muhlenberg, a member of the Continental Congress, Speaker of the House during the First and Third congresses of the United States, and twice candidate of the Federal party for governor of Pennsylvania; Henry Ernest Muhlenberg, D. D., eminent naturalist and Lutheran clergyman. The descendants of these three eminent men, as well as those of their four sisters, all achieved much distinction in the many different fields of human endeavor to which they devoted themselves. Reverand Henry Melchior Muhlenberg immigrated in 1742. On 17 August 1844 Henry A Muhlenberg biography. Maria Salome Muhlenberg was born in 1766. She was the daughter of Reverand Henry Melchior Muhlenberg and Anna Maria Weiser. Maria Salome Muhlenberg died in 1827. (?) Spyker was born circa 1784 at Berks, Pennslyvania. He was the son of John Spyker and Anna Elizabeth Seidel. (?) Spyker was born circa 1787 at Berks, Pennsylvania. (?) Spyker was born circa 1790 at Berks, Pennsylvania. She was the daughter of John Spyker and Anna Elizabeth Seidel. Sarah Spyker was born on 15 September 1800 at Berks, Pennsylvania. Martin Wenger was born on 23 December 1780. He married Maria Elizabeth Light on 15 November 1801. Martin Wenger died on 23 November 1860 at Pennsylvania at age 79. Married Name 15 November 1801 As of 15 November 1801,her married name was Wenger. 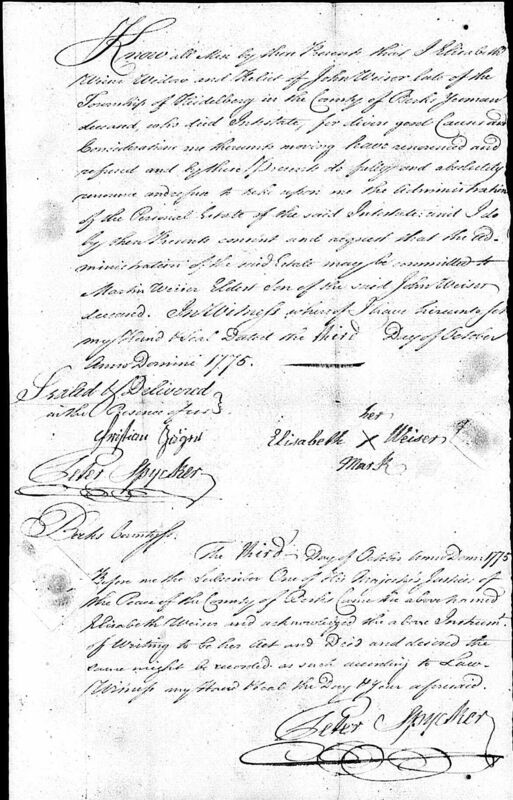 Maria Elizabeth Light married Martin Wenger on 15 November 1801. Name Variation Miron B. Spyker was also known as Myron. Miron B. Spyker was born in February 1858 at Pennsylvania. As of 1900, Miron B. Spyker was never married. He died on 7 September 1910 at State Hospital, Conewago, Warren, Pennsylvania, at age 52. 15 April 1910 State Hospital for the Insane, Conewango, Warren, Pennsylvania He was listed as an inmate on the 1910 Census at State Hospital for the Insane, Conewango, Warren, Pennsylvania. [S245] U.S. Federal Census 1900 U.S. Federal Census, by Ancestry.com, Year: 1900; Census Place: Conewango, Warren, Pennsylvania; Roll: 1492; Page: 8B; Enumeration District: 0132; FHL microfilm: 1241492.